LNM employs a fusion of the reading approach and the traditional grammar/translation method. Lessons on Latin morphology, grammar, and syntax flow from and employ examples from the Latin readings that are adapted from Roman and post-antique Latin writers. Such readings provide students a literary-rich vocabulary. Ample exercises build students’ facility with reading and writing Latin. 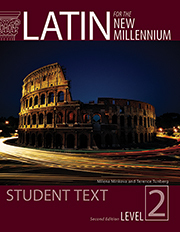 A Talking section in each chapter provides contemporary Latin and lends itself to practicing oral Latin while the Teacher's Manuals feature a bounty of aural-oral activities and exercises. To learn more about the “smart pedagogy” and methodology of the Latin for the New Millennium program, check out this 32-page comprehensive overview. The Latin for the New Millennium website contains a variety of materials and resources for your exploration as you consider adopting the program. For an overview of the changes and new material in LNM. The Second Edition includes a list of English derivatives for the Vocabulary to Learn of each chapter (and a new exercise in the workbook) as well as an additional six new exercises that provide laddering and reinforcement as suggested by teachers using Latin for the New Millennium. The Second Edition also includes corrections and minor changes to macrons and illustrations. For a list of changes by chapter, click here.